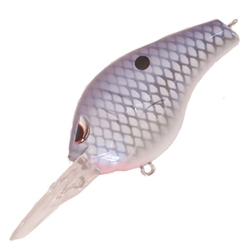 The Spro Fat Papa crankbait was designed by B.A.S.S. Elite Series pro, Russ Lane. Russ designed the Fat Papa crankbait to be tournament ready bait right out of the package. While the Fat Papa 55 features a subtle rattle, the Fat Papa 70 bait is silent; both are stealthy and have a wide sweeping wobble action that's sure to catch wary bass in every kind of lake condition. Russ handpicked his favorite colors and SPRO made them just to his specifications. The Fat Papa is bound to help every angler catch more fish!